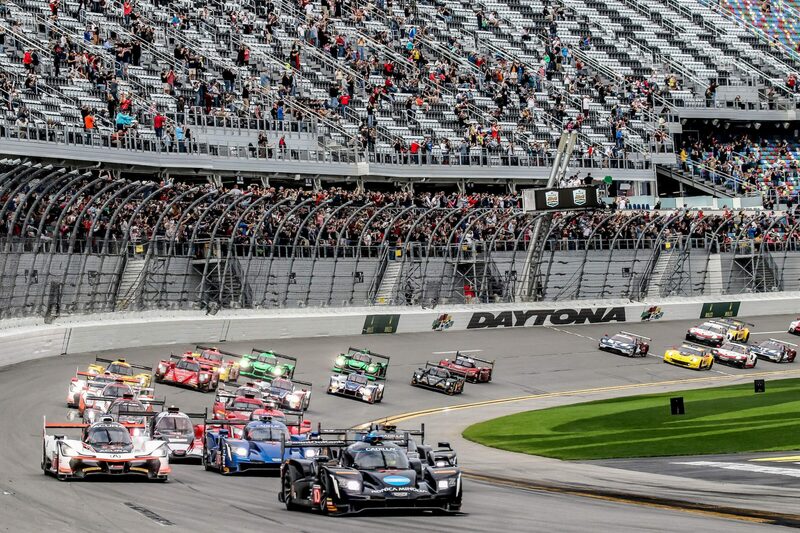 An amazingly trouble-free, five-year run at the iconic Rolex 24 At Daytona came to an abrupt halt Sunday for the defending race- and series-champion No. 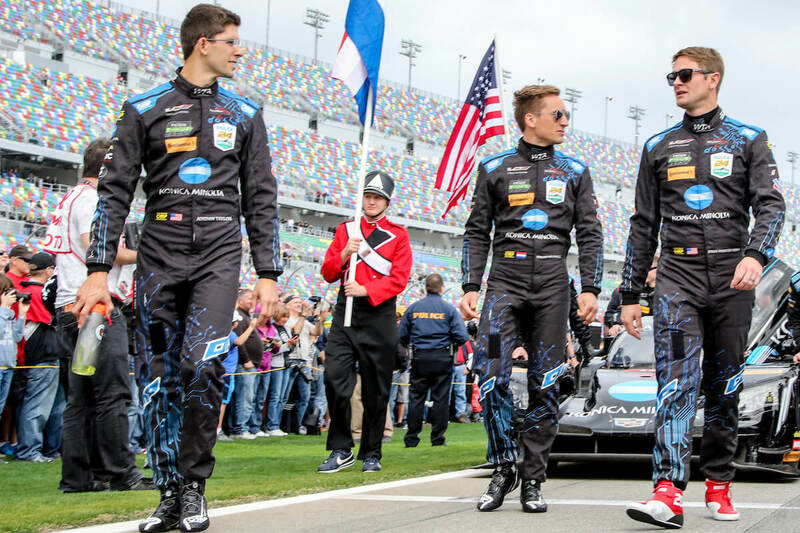 10 Konica Minolta Cadillac DPi-V.R team, which this year features full-time co-drivers Jordan Taylor and Renger van der Zande and third driver Ryan Hunter-Reay. After putting nary a wheel off the 3.56-mile, 12-turn Daytona (Fla.) International Speedway road course at the previous five IMSA WeatherTech SportsCar Championship season openers, logging respective race-day finishes of second, second, third, second and first and leading just short of 1,000 laps along the way, the team retired just past the two-thirds mark of this weekend’s 24-hour event after a mysterious issue led to right-rear tires going down on the high-speed superspeedway circuit no fewer than five times with damaging consequences on two of those occasions. The team’s fifth and final tire puncture occurred at the 16-hour, 40-minute mark and, for the second time in the race, resulted in heavy right-rear body component damage inflicted by flopping tire tread as van der Zande tried to carefully limp the sleek, black Prototype-class entry back to pit lane from the farthest reaches of the massive circuit. 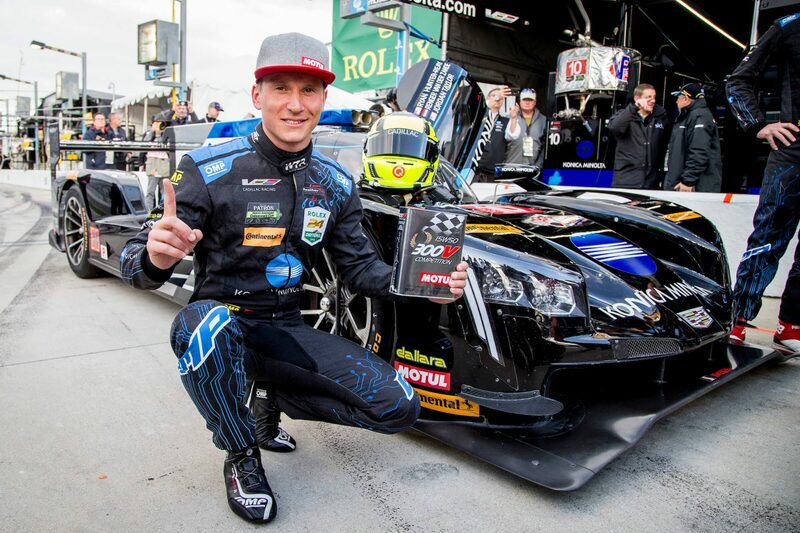 It was the second such trip back to the pit lane for van der Zande that inflicted heavy damage to the racecar, the first coming as the result of a tire gone down at the eight-hour, 33-minute mark. Team and Cadillac officials collectively agreed to retire the car in the interests of safety. “Based on the issues we had throughout the night and the early morning part of the race, and multiple ways of trying to fix it with no positive results, we had to retire the car with nothing to gain by keeping the drivers and the car out there while we had everything to lose,” team manager Travis Houge said. Before the baffling series of incidents began just short of the five-hour mark Saturday, it looked to be very much business as usual for the No. 10 Konica Minolta Cadillac DPi-V.R team. A successful defense of last year’s Rolex 24 win appeared to be a distinct possibility, especially after team newcomer van der Zande earned the pole position in a thrilling qualifying session Thursday. Van der Zande got off to a clean race start Saturday afternoon and comfortably led the opening 18 laps before the opening round of scheduled pit stops. From there, he, Hunter-Reay and Taylor easily maintained the team’s position in the top-five over the first four hours and 50 minutes. It was then that Taylor radioed that he suspected a right-rear tire going down while navigating the “bus stop” portion of the backstraight. He was able to safely return to pit lane, received a fresh set of tires, and resumed in eighth place. Three hours later, at the seven-hour, 27-minute mark, van der Zande had his first of four tires go down. Like Taylor’s incident, he was able to make it to pit lane without incident and was able to resume just outside the top-five. But, an hour later, van der Zande was not as fortunate as his right-rear tire went down violently as he was exiting the infield portion of the road circuit. He limped the car back to the pit lane, from where the car then pushed to the garage. It took 12 minutes for the crew to repair the heavy damage inflicted by the flopping tire tread. Van der Zande resumed in 17th place, 10 laps down, with 15 hours of racing to go. Things appeared to settle down for the team over the next seven hours as van der Zande, Hunter-Reay and Taylor were able to cycle through their stints without incident. And, with help from attrition, they were able to work their way into the top-five shortly before sunrise and made up several of the lost laps. 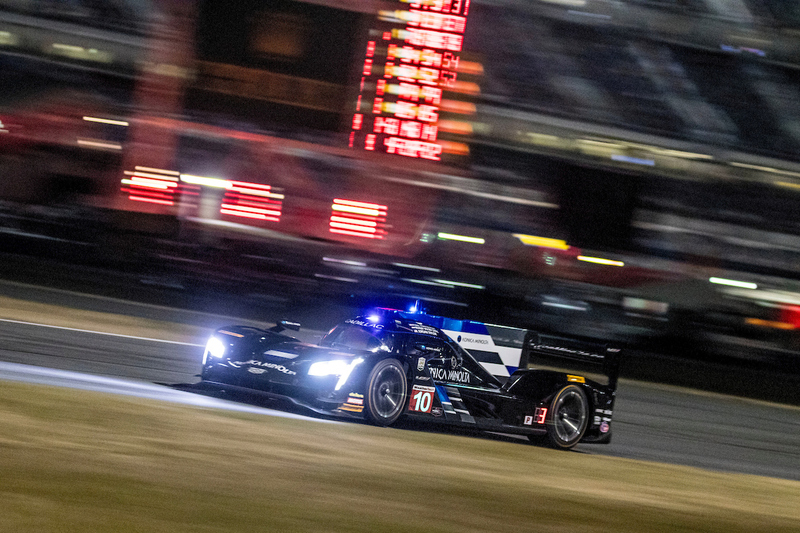 At the 15-hour, 27-minute mark, van der Zande experienced his third right-rear tire going down, this time just two laps after taking on a fresh set during a fuel-and-tire stop. He again was in position to dive into the pits, replace the tire and resume without major incident in sixth place. But then came the fateful, final incident of the race for the team at the 16-hour, 40-minute mark. It left the team with a 15th-place finish and a 19-point deficit in the Prototype-class standings to the race-winning No. 5 Action Express Racing Cadillac DPi-V.R of Christian Fittipaldi, Joao Barbosa and Felipe Albuquerque. Hunter-Reay was the only driver to not experience a tire going down during the event.